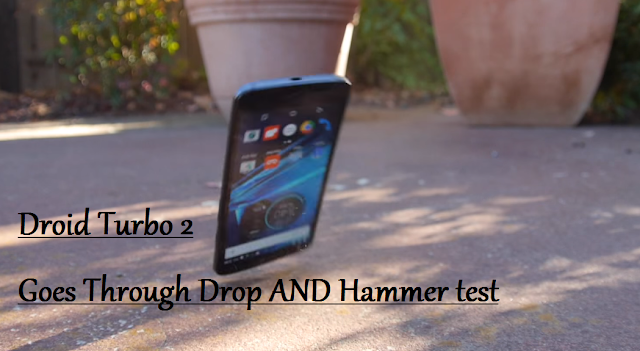 Motorola's Droid Turbo 2 goes through Drop and Hammer Test ! Motorola's New Droid Turbo 2 is Shatterproof and According to Motorola this new smartphone has 5 layers of protection , which all act together to protect the Screen from breaking . Also Read - They Tried Every Attempt To Break Motorola's Droid Turbo 2 : But Its unbreakable ! TechRax ( YouTube ) has performed a Drop test from side and front of the Smartphone and it has survived ! After the Drop Test they performed Hammer test and again the Screen proved that its Shatterproof . According to TechRax Its the first Smartphone ever that has no cracks on the Screen after such a Hammer test . Comment below , what you think about that Amazing Smartphone !